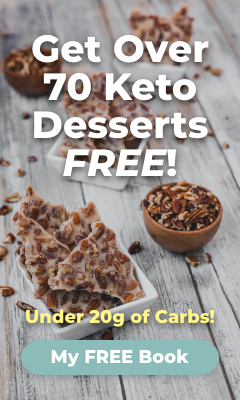 Sloppy joes are often forbidden on low-carb and keto diets. This classic comfort food is usually loaded with sugar and served on starchy buns—but no more! Rather than using ketchup and brown sugar, we’ve swapped in the natural, keto-friendly goodness of tomato paste with a touch of stevia for balance. Also, while traditional sloppy joes add bell peppers into the saucy mix, we serve it up inside a pepper. Replace that carb-heavy bun and create the perfect cozy weeknight meal! <h4><p style="color: rgba(20, 117, 135, 1)">Bells of the Ball</p></h4> Although their spicy cousins get most of the attention, mild bell peppers are great for adding flavor, texture, and health benefits to your meals. If you choose orange, yellow, or red varieties, you’ll get particularly high doses of key vitamins. Vitamin A—also called beta carotene—is essential for healthy eyes. It helps you see better at night and prevents macular degeneration and cataracts. Meanwhile, Vitamin C supports the immune system. It also helps your body absorb iron, preventing anemia. Red bell peppers are among the best sources of Vitamin C—just one can provide up to 169% of your daily allowance! <h4><p style="color: rgba(20, 117, 135, 1)">Three Cheers for Chili Powder</p></h4> Chili powder isn’t just about ground chile peppers. It gets its characteristic kick from a blend of spices that add a smoky, savory punch to any dish. Most chili powders include spicy cayenne—plus cumin, garlic powder, oregano, and paprika—though each has its own unique recipe. Beyond punching up the flavor of your dish, chili powder may also help you live longer! Studies have shown that people who regularly eat chiles have a lower risk of mortality and show fewer signs of aging. This may be due to the peppers’ high concentrations of IGF-1, an anti-aging hormone. <h4><p style="color: rgba(20, 117, 135, 1)">Sloppy Joe Stuffed Peppers</p></h4> <h5>Prep Time: 15 mins | Cooking Time: 30 mins | Serves: 4</h5> <h5><p style="color: rgba(20, 117, 135, 1)">Ingredients:</p></h5> * 2 large bell peppers, halved lengthwise, seeds removed * 1 pound lean ground beef * 1 tablespoon olive oil * 1 medium onion, diced (about ½ cup) * 2 cloves garlic, minced * 3 tablespoons tomato paste * 1 tablespoon spicy brown mustard * 2 teaspoons cider vinegar * 2 teaspoons Worcestershire sauce * 1 teaspoon soy sauce * 1 cup low-sodium beef broth * ½ teaspoon chili powder * ½ teaspoon smoked paprika * ½ teaspoon black pepper * ¼ teaspoon powdered stevia * 1 ½ cups (6 ounces) Monterey jack cheese, shredded (Note: you can also use pepper jack for a spicy kick!) <h5><p style="color: rgba(20, 117, 135, 1)">Instructions:</p></h5> 1. Preheat oven to 375°F. 2. Place the halved peppers, cut side down, in a small roasting pan and cover with foil. Bake for 15-20 minutes while preparing the filling. Or you can microwave the peppers for 3-4 minutes on high until soft. 3. Meanwhile, prepare the sloppy joe filling. Heat a medium skillet over medium-high heat. When hot, add the olive oil, then add the onions. Cook, stirring occasionally, until the onions soften, about 5 minutes. 4. Add the ground beef. Cook, stirring to break it into small pieces, until browned and cooked almost through, about 5-8 minutes. 5. Add the garlic, tomato paste, mustard, vinegar, Worcestershire and soy sauces, beef broth, spices, and stevia to the pan. Stir well to combine. Turn the heat to medium-low and simmer uncovered until most of the liquid has reduced, about 15 minutes. 6. Remove the peppers from the oven and pour out any liquid that’s accumulated. 7. Stir 1 cup of the cheese into the sloppy joe mixture and divide evenly among the pepper halves. 8. Bake for 20-30 minutes or until the peppers are hot and bubbly. 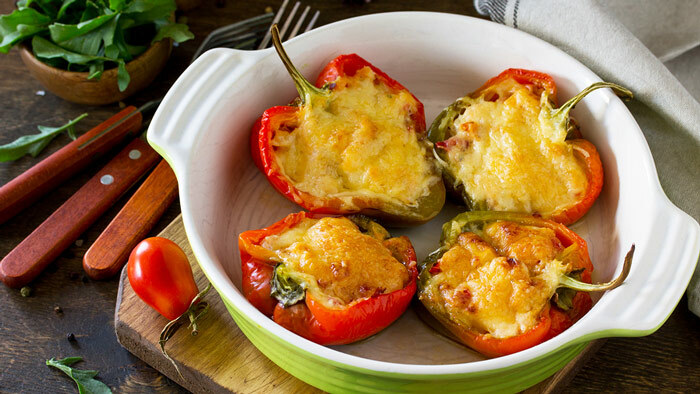 Top the peppers with the remaining 1/2-cup cheese and return to the oven until the cheese has melted, 2-3 minutes.